Update: It looks like there is a 40-60% chance of rain Saturday morning but our Dawn Chorus event is still on! Please remember to dress for the weather. If there is a lot of rain, the birds might be a little quiet, but it's always a special experience to be in the park at dawn. See you tomorrow! 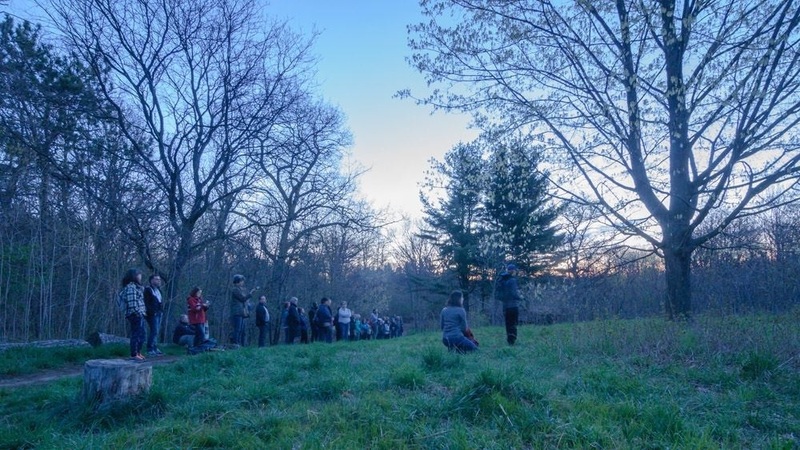 Calling all early birds: flock to High Park at the crack of dawn for a quiet hike to a secluded spot to hear the morning chorus of birdsong as the sun rises. Tons of songbirds will be passing through during spring migration as Toronto is on a bird superhighway. Experienced birders will be on hand to help identify the birds we hear and see. No pre-registration is required and this is a free event. And - there will be coffee! NOTE: Please check www.highparknaturecentre.com for updates as the event will be cancelled in the event of heavy rain or wind. The 300 Bloor / Danforth Night Bus stop at High Park Ave. is the closest bus stop. From there walk into High Park south along Colborne Lodge Drive to the High Park Nature Centre at the Forest School. We are north east of the tennis courts. This event is part of the 2018 Toronto Bird Celebration, coordinated by Bird Studies Canada, running from May 12 - May 27. To learn more about the Toronto Bird Celebration, you can click here: http://torontobirdweek.ca/.